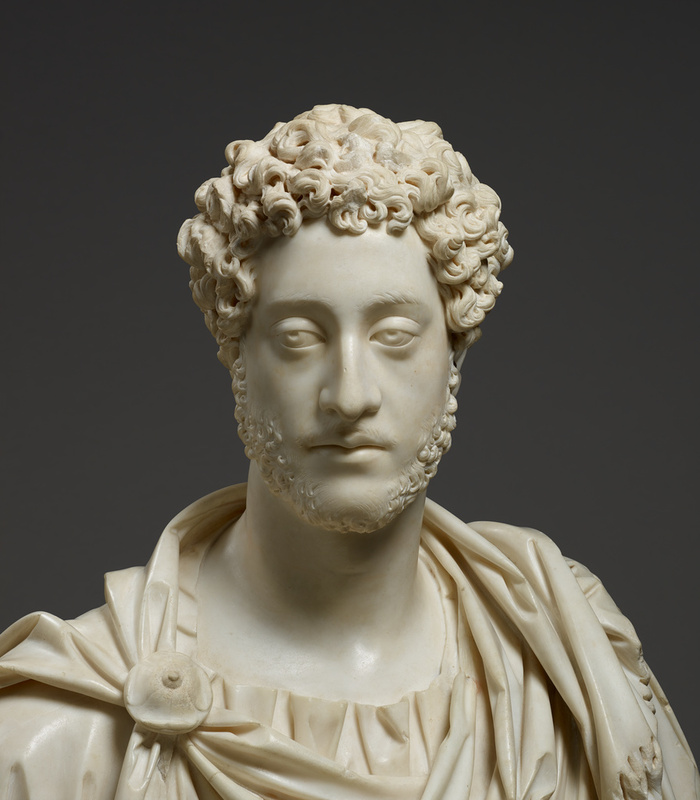 The expression on this portrait of the Roman Emperor Commodus (ruled A.D. 180-192) perhaps belies his noted love of combat and fighting in the arena. 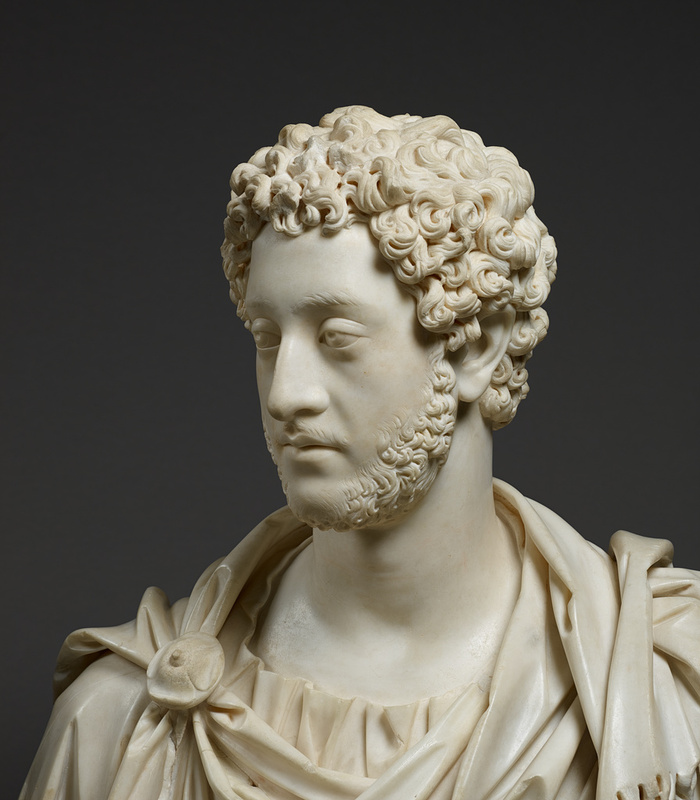 Unlike his more intellectual and philosophical father, Marcus Aurelius, Commodus was ruthless enough to order killings even of his own sister and aunt. He is depicted in military garb: a draped robe and fibula, or pin, rather than in the clothing of a senator or religious figure. In his era, it was customary for official portraits of rulers to be carved in Rome. From these, multiple copies would be carved, and sent out to provincial capitals around the empire, where they would become the models for additional portraits. Historians classify such portraits as numbered "types," which correspond to eras of the subjects' lives. By comparing elements such as hairstyles with those on portraits depicted on coins, scholars can date such types quite precisely. 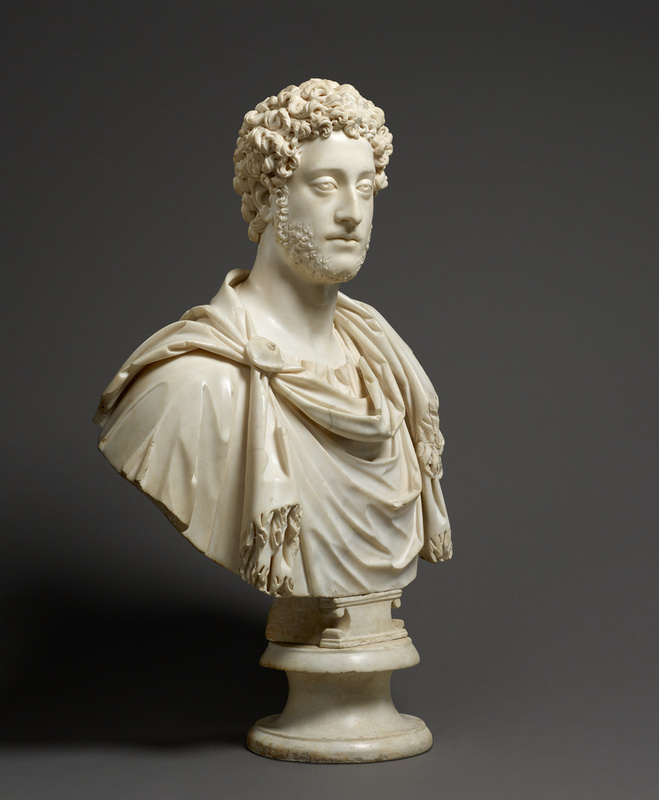 This bust is an example of Commodus' fifth type, which corresponds to his sole ascendancy to the throne, after serving as co-regent with his father. 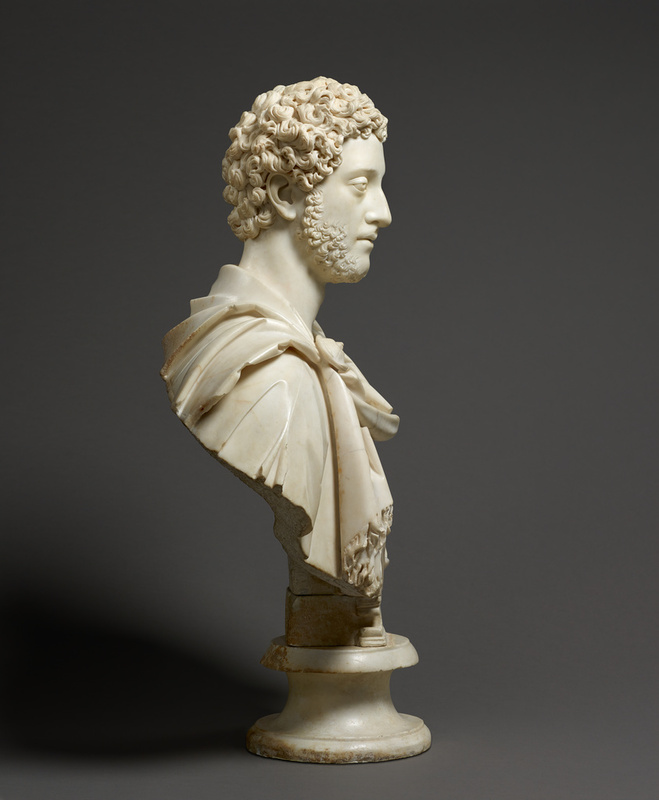 When the Getty purchased this bust in 1992, scholars debated whether it was the work of a Roman carver, or a superb copy by a later artist who mimicked the Roman style. 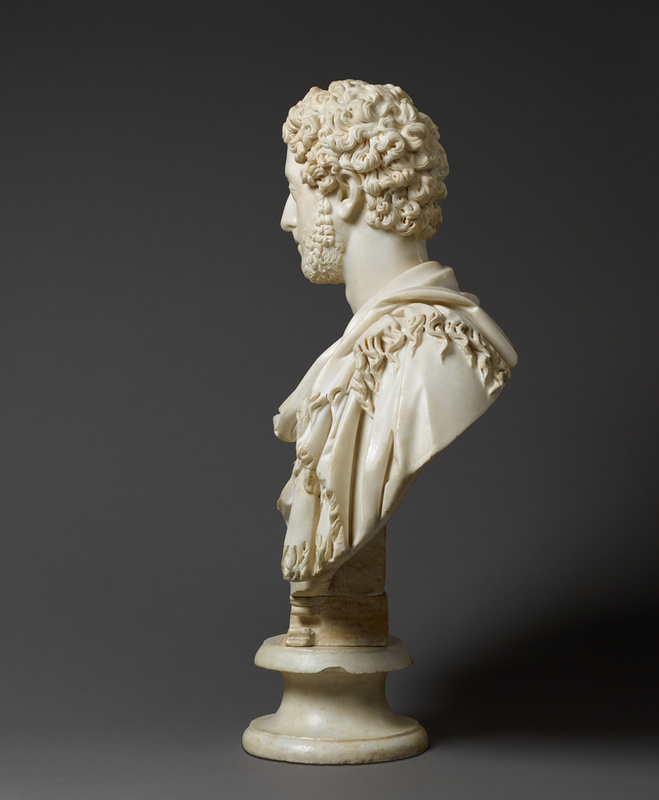 It came from the collection of the fourth Earl of Carlisle at Castle Howard, Yorkshire, who had acquired it in the 1700s, likely as an ancient Roman bust. What appears to be the work's untouched white surface is now known to indicate previous restoration and recarving. 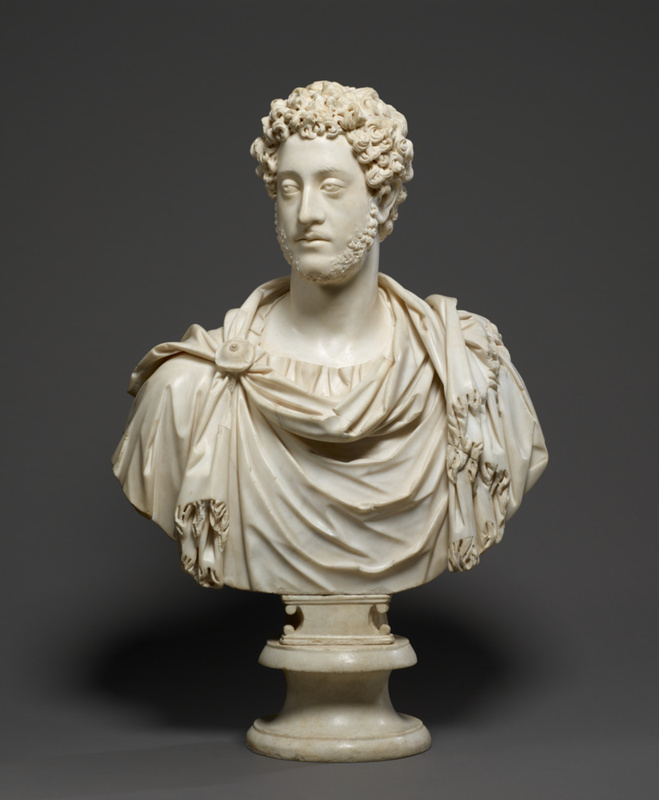 Contemporary guidelines in conservation favor careful preservation of the ancient surface for scientific and aesthetic reasons, but the stark color and texture of this bust suggest that prior restorers used bleach or acid to clean it of perceived blemishes. 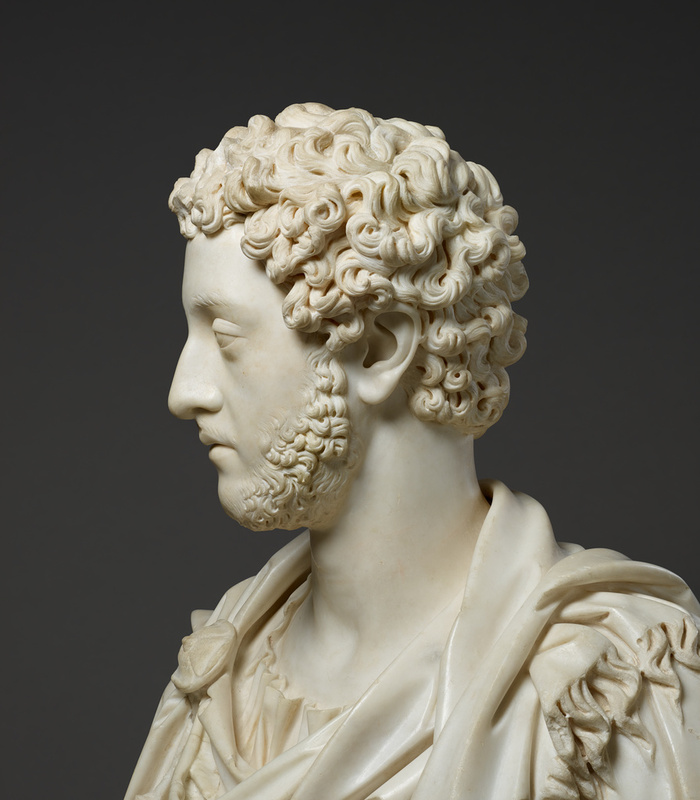 Another example of restoration is on the left side of the Emperor's curly beard, where one rectangular area has curls carved in a flatter and less naturalistic way than those around it. This is likely because a post-ancient restorer re-carved curls that were damaged or missing from antiquity. 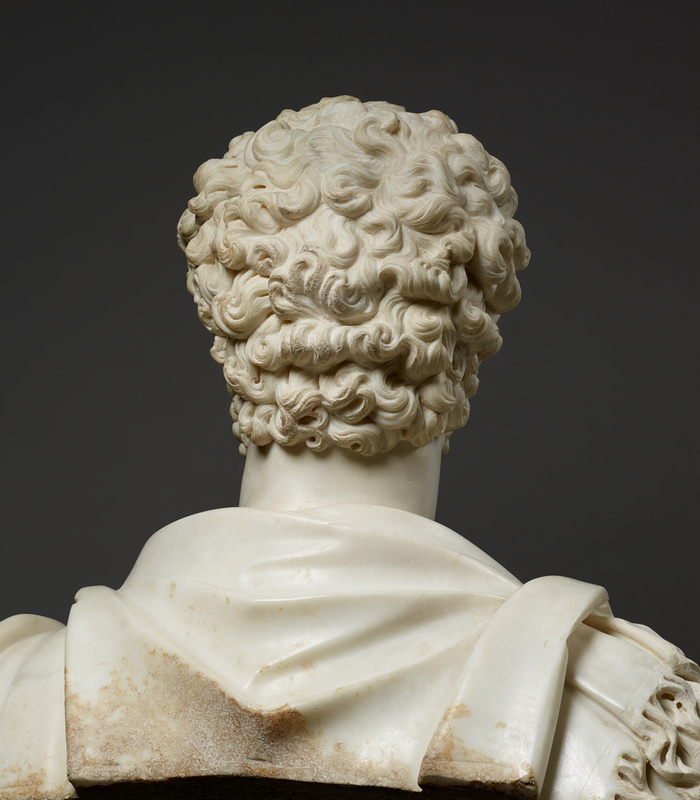 Other indicators of the bust's ancient origin are the dark brown encrustations on the central back rim. When experts sampled this encrustation and examined it under a microscope, they discovered traces of material that confirmed burial or long-term exposure to the elements. Probably acquired by Henry Howard, fourth earl of Carlisle, English, 1694 - 1758 (Castle Howard, Yorkshire, England), by inheritance to his son, Frederick Howard, 1758. Frederick Howard, fifth earl of Carlisle, 1748 - 1825 (Castle Howard, Yorkshire, England), by inheritance to his son, George Howard, 1825. George Howard, sixth earl of Carlisle, 1773 - 1848 (Castle Howard, Yorkshire, England), by inheritance to his son, George William Frederick Howard, 1848. George William Frederick Howard, seventh earl of Carlisle, English, 1802 - 1864 (Castle Howard, Yorkshire, England), by inheritance to his brother, Reverend William George Howard, 1864. William George Howard, eighth earl of Carlisle, English, 1808 - 1889 (Castle Howard, Yorkshire, England), by inheritance to his nephew, George James Howard, 1889. George James Howard, ninth earl of Carlisle, English, 1843 - 1911 (Castle Howard, Yorkshire, England), by inheritance to his wife, Rosalind Frances Stanley, 1911. Rosalind Frances Stanley, countess of Carlisle, English, 1845 - 1921 (Castle Howard, Yorkshire, England), by inheritance to her daughter, Mary Henrietta Murray, 1921. Lady Mary Henrietta Murray, English, (Castle Howard, Yorkshire, England), by gift to her brother, Hon. Geoffrey William Algernon, 1921. Hon. Geoffrey William Algernon Howard, English, 1877 - 1935 (Castle Howard, Yorkshire, England), upon his death, placed in a trust, Castle Howard Estate Ltd., 1935. Edric van Vredenburgh, Ltd. (London) (London, England), sold to the J. Paul Getty Museum, 1992. 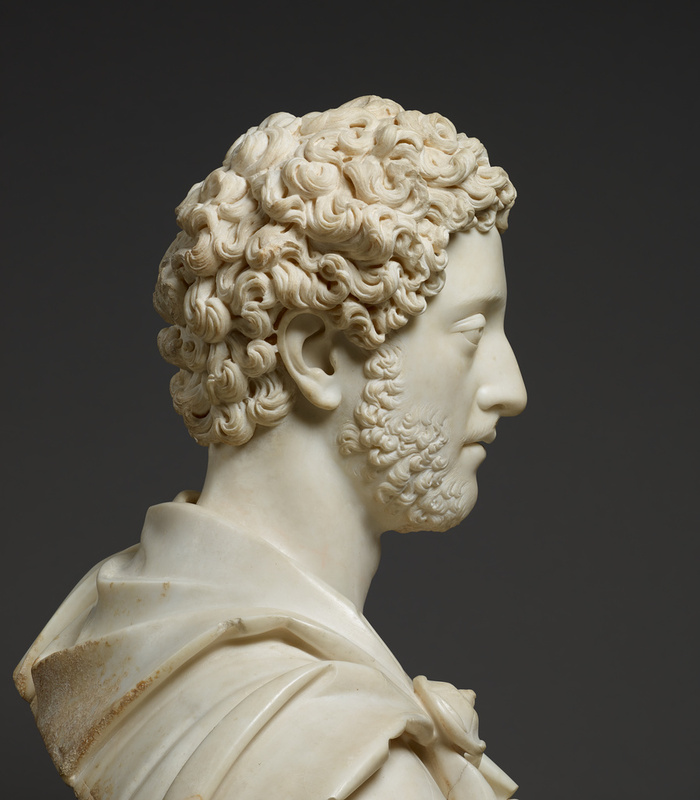 Tronchin, Francesca C. "Investigating a posthumous portrait of Augustus in the Museum of Fine Arts, Boston." Journal of the History of Collections 28 (2016), 310, footnote 95. Dallaway, James. Anecdotes of the Arts in England (London: Printed for T. Cadell and W. Davies, 1800), p. 196. Neale, J.P. Yorkshire Seats ([London? ], 1829-30), p. 4. Waagen, Gustav Friedrich. Treasures of Art in Great Britian: Being an Account of the Chief Collections of Paintings, Drawings, Sculptures, Illuminated Mss., &c., &c. 3 vols. (London: John Murray, 1854), vol. 3, p. 331. Michaelis, Adolf. "Die Privatsammlungen antiker Bildwerke in England." Archaeologische Zeitung 32 (1875), p. 20, no. 28. Michaelis, Adolf Theodor Friedrich. Ancient Marbles in Great Britain (Cambridge: University Press, 1882), p. 329, no. 38. Bernoulli, Johan Jakob. Römische Ikonographie, 4 vols. (Stuttgart, 1981), vol. 2, pt. 2, p. 233, no. 47. Wegner, Max, and R. Unger. "Verzeichnis der Kaiserbildnisse von Antoninus Pius bis Commodus, 2." Boreas 3 (1980), p. 81. Matthew, C. "Buy Buy Brideshead." World of Interiors (September 1991), p. 101, fig. 5. "Acquisitions/1992." The J. Paul Getty Museum Journal 21 (1993), p. 147, no. 74. Fusco, Peter. Summary Catalogue of European Sculpture in the J. Paul Getty Museum (Los Angeles: J. Paul Getty Museum, 1997), p. 72, ill.
Fogelman, Peggy, and Peter Fusco, with Marietta Cambareri. 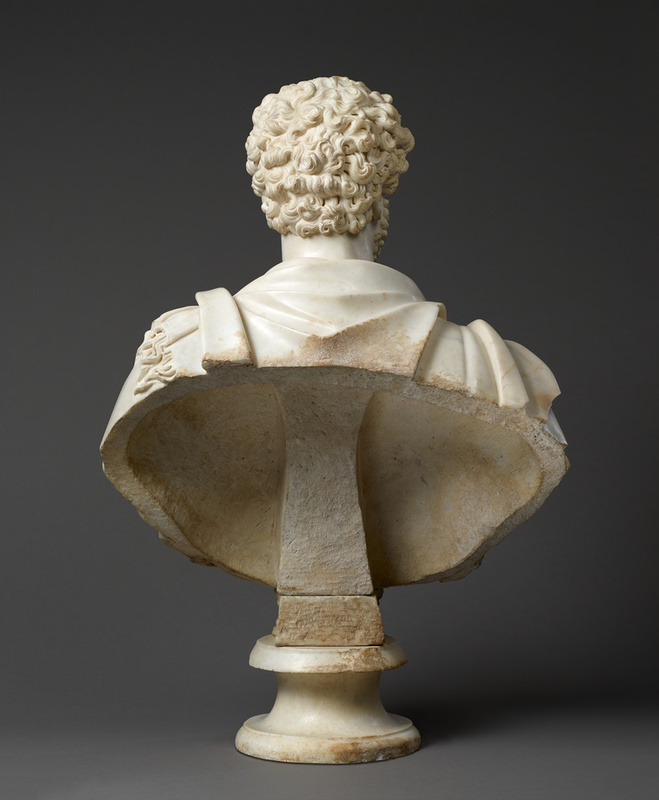 Italian and Spanish Sculpture: Catalogue of the J. Paul Getty Museum (Los Angeles: J. Paul Getty Museum, 2002), pp. 128-39, no. 17. Fogelman, Peggy, and Peter Fusco, with Marietta Cambareri. Italian and Spanish Sculpture: Catalogue of the J. Paul Getty Museum Collection (Los Angeles: J. Paul Getty Museum, 2002), pp. 128-139, ills. 17-17A, 17F-17I, 17M. The J. Paul Getty Museum Handbook of the Collections. 7th ed. (Los Angeles: J. Paul Getty Museum, 2007), pp. 190-91, ill. The J. Paul Getty Museum Handbook of the Antiquities Collection. Rev. ed. (Los Angeles: J. Paul Getty Museum, 2010), p. 166.